Yesterday probably wasn't cold enough for this trench, but it was certainly cool enough for me. I'll use any excuse to wear it. As must as I love summer, I'm ready for it to end. Looking forward to chillier days. Nice pics, Darren! I need booties like those...can't believe they are from CR. There was a time I have detested peep-toe boots and peep-toe booties. I like these here, though. They are as lovely as the rest of your outfit, Khatu. Lovely stuff! Ok. You are so classic. What a textbook look. I thought the trench had different coloured sleeves for a moment.. Love that it's sleeveless. Opens up a whole new world of layering opportunities! I love your sleeveless trench and those killer booties! The sleeveless trenchcoat is a first time for me. I love how you've put this look together. The purse really ties in well with this outfit and these colors got me all excited for fall! oooh, i'm loving these peep-toe booties!! definitely have to check out CR sometime. and the sleeveless trench looks great on you! love love love this outfit! you are super cute! I love how classic yet edgy and modern this look is with the sleeveless trench and open-toed booties! The past few days have felt like October weather - not late August/early September. It's definitely time to break out the outerwear - sad! Ooh! 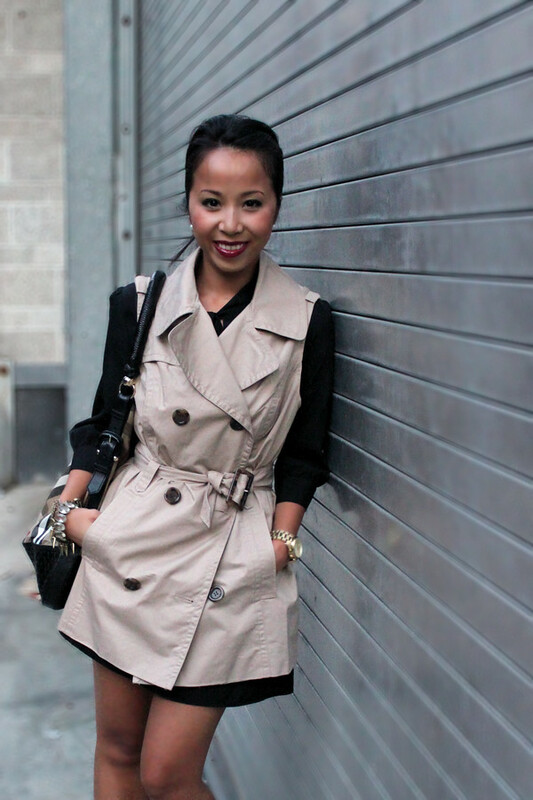 I love the sleeveless trench! That is the perfect fall lipstick shade! I like the shoes and the Burberry bag. Is that a sleeveless trench? I LOVE it! Such an updated look for a classic piece. The way you wear your trench reminds me of a coat I saw at Zara but was too big for me. Love this look on you! Love the outfit and your makeup looks great here! This is awesome! I would have had no clue how to wear this trench, but you did an amazing job! that trench is so fabulous! Love the outfit and I especially love the color lipstick you are wearing! What brand/shade is that? Oh it's sleeveless? Totally thought the sleeves were a diff colour .. A. Wang style.